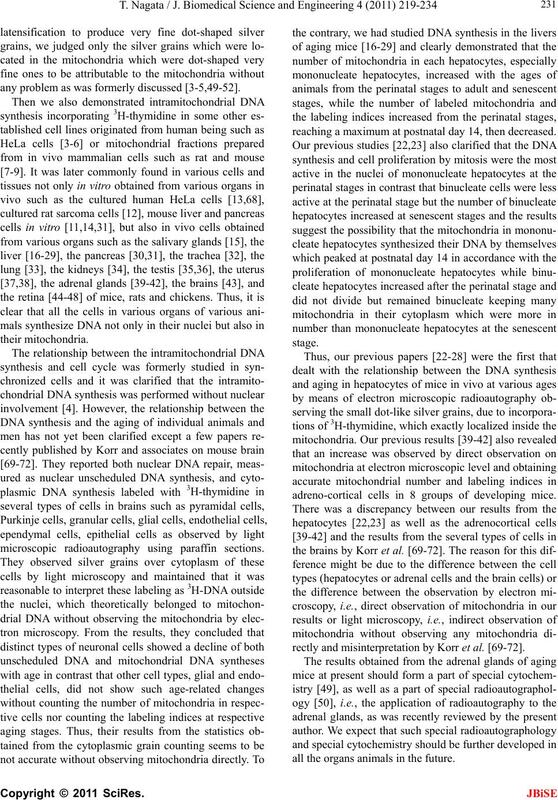 doi:10.4236/jbise.2011.43031 Published Online March 2011 (http://www.SciRP.org/journal/jbise/). Anatomy, Shinshu Institute of Alternative Medicine and Welfare, Nagano, 380-0816 Japan. Received 22 March 2010; revised 20 July 2010; accepted 23 July 2010. NIH publication No. 86-23 (revised 1985). GBq/mM) in saline, at 9 a.m., one hour before sacrifices. The dosage of injections was 370 KBq/gm body weight. tal (Abbott Laboratories, Chicago, ILL, USA) anesthesia. Epok 812 (Oken, Tokyo, Japan). 400kV for observing thick specimens . 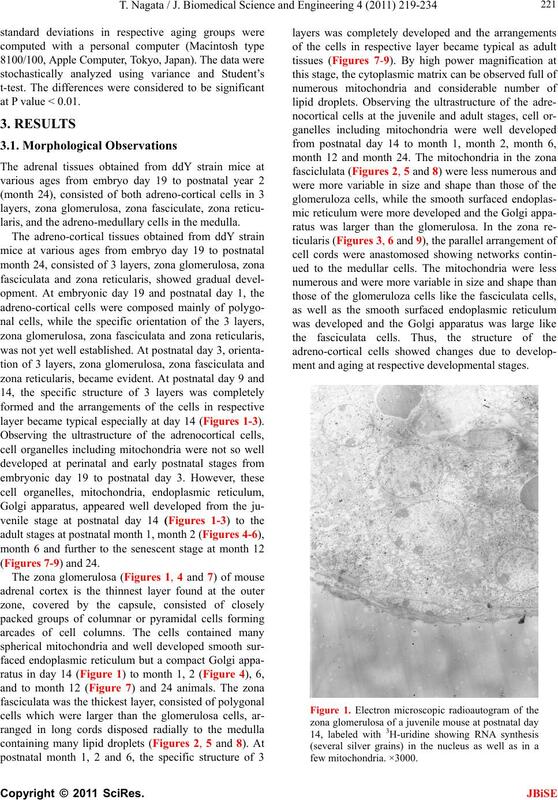 at P value < 0.01.
laris, and the adreno-medullary cells in the medulla. layer became typical especially at day 14 (Figures 1-3). ment and aging at respective developmental stages. well as in several mitochondria. ×3000. well as in a few mitochondria. ×3000. in a few mitochondria. ×3000. 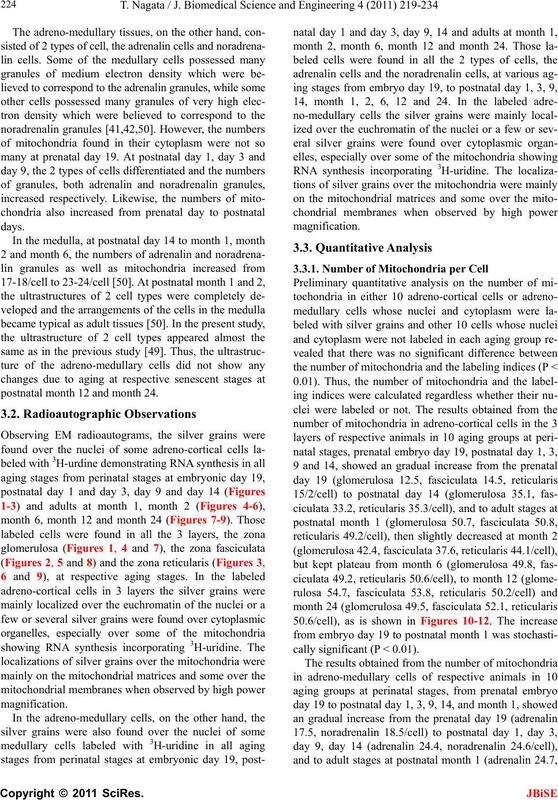 synthesis in the nucleus and a few mitochondria. postnatal month 12 and month 24.
cally significant (P < 0.01). 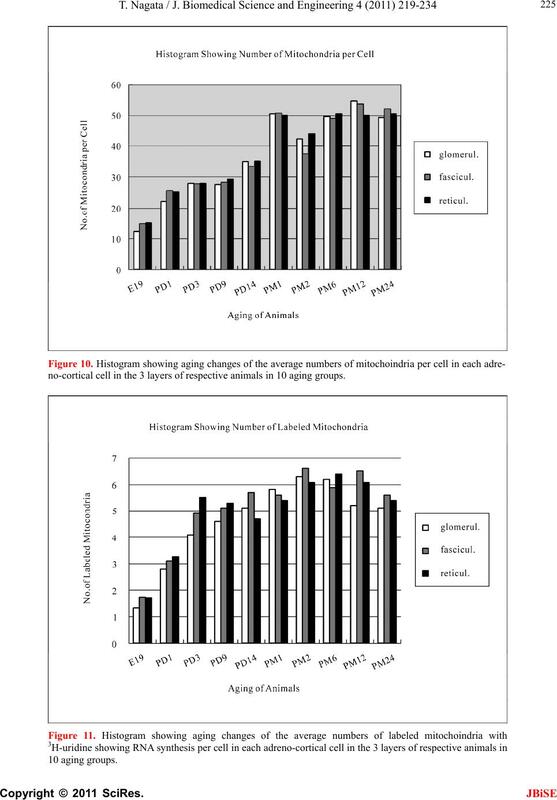 no-cortical cell in the 3 layers of respective animals in 10 aging groups. month 2 4 w as n ot significant. 0.32/cell) and 24 (adrenalin 0.38, noradrenalin 0.35/cell). month 24 were stochastically significant (P < 0.01). adrenalin and noradrenalin cells. × 3 000. Figure 15. 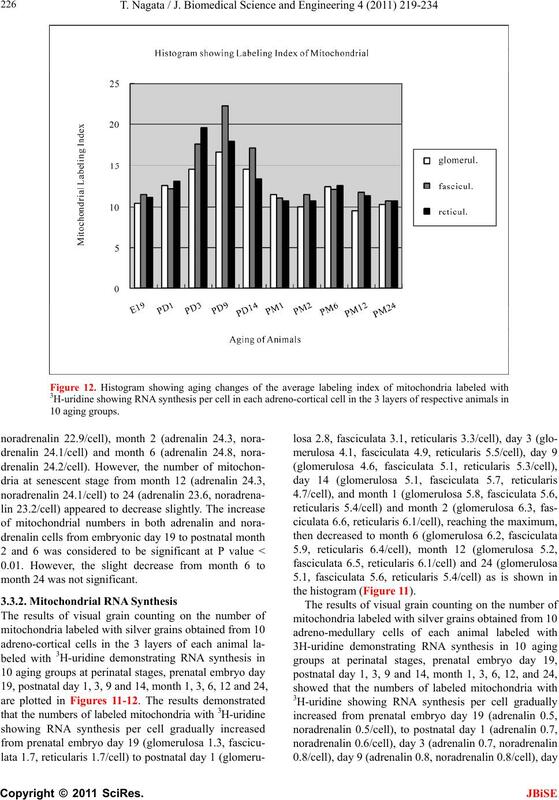 Histogram showing number of mitochondria per cell. Figure 16. 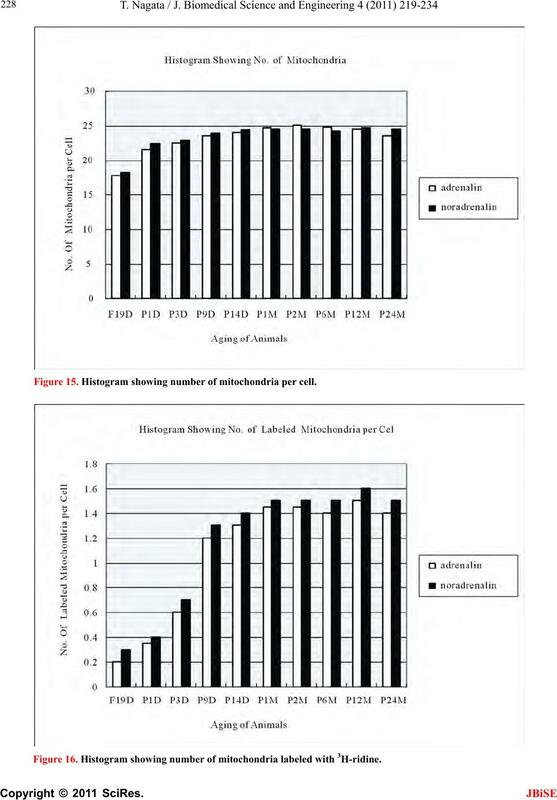 Histogram showing number of mitochondria labeled with 3H-ridine. Figure 17. Histogram showing the labeling index labeled with 3H-uridine. and 24, slightly different from DNA synthesis. the nucleus belong ed to any layers of th e adrenal cortex. aged stage at month 6 to senescent stage up to month 24.
nescent at month 24 due to aging. tion in the replication of the mitochondrial DNA . chondrial localization in avian and mammalian cells. and calculated various values of resolutions [4,5,64-66]. certain territory within a resolution boundary circle. any problem as was formerly discussed [3-5,49-52]. 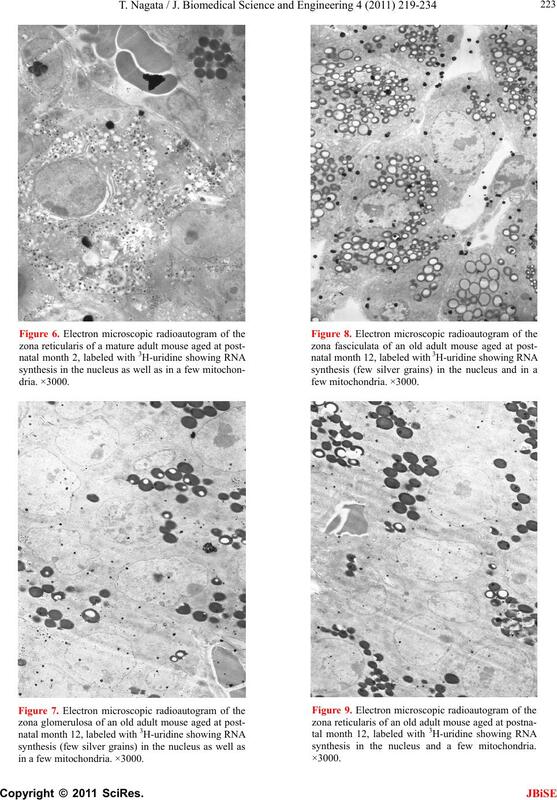 microscopic radioautography using paraffin sections. reaching a maximum at postnatal day 14, then decreased. adreno-cortical cells in 8 groups of developing mice. rectly and misinterpretation by Korr et al. [69-72]. all the organs animals in the future. creased to day 14, month 1, 2, 6, 12 and 24.
from month 1 to 24.
tal month 1-6 and decreased due to aging. copy during the course of this study. 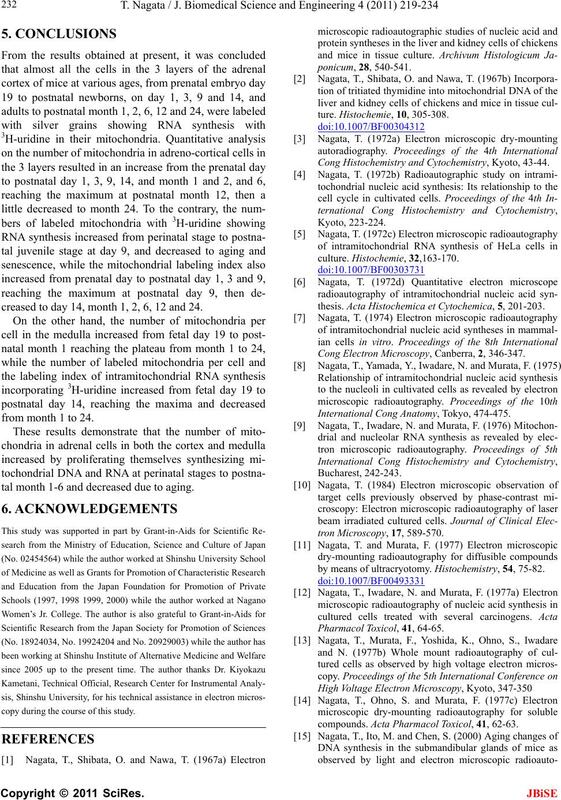 Cong Histochemistry and Cytochemistry, Kyoto, 43-44.
thesis. Acta Histochemica et Cytochemica, 5, 201-203. 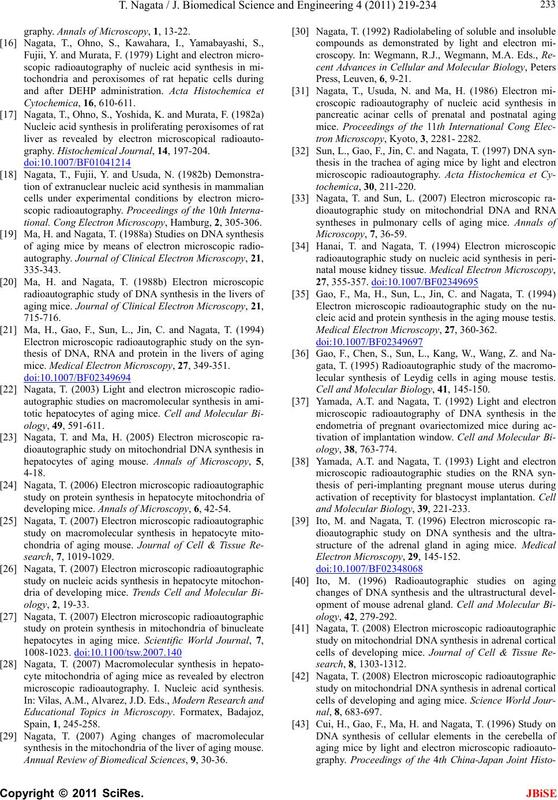 Cong Electron Microscopy, Canberra, 2, 346-347.
International Cong Anatomy, Tokyo , 474-475.
by means of ultracryotomy. Histochemistry, 54, 75-82.
compounds. Acta Pharmacol Toxicol, 41, 62-63.
graphy. 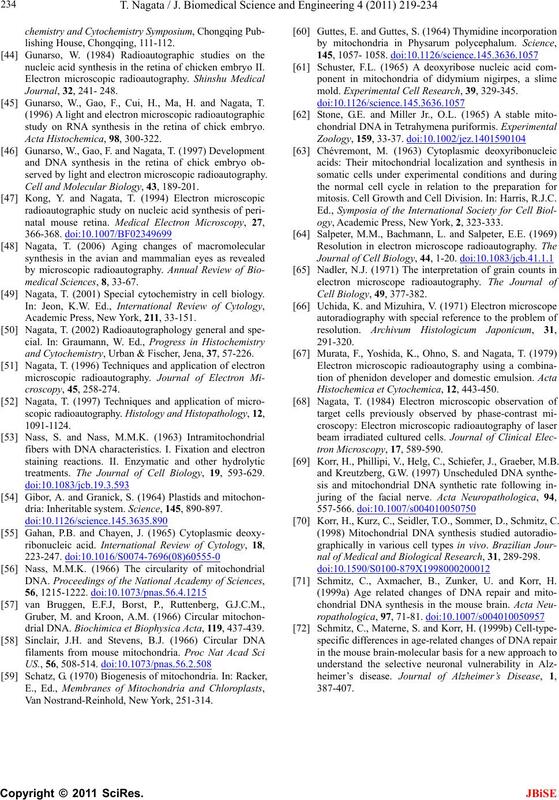 Annals of Microscopy, 1, 13-22.
graphy. 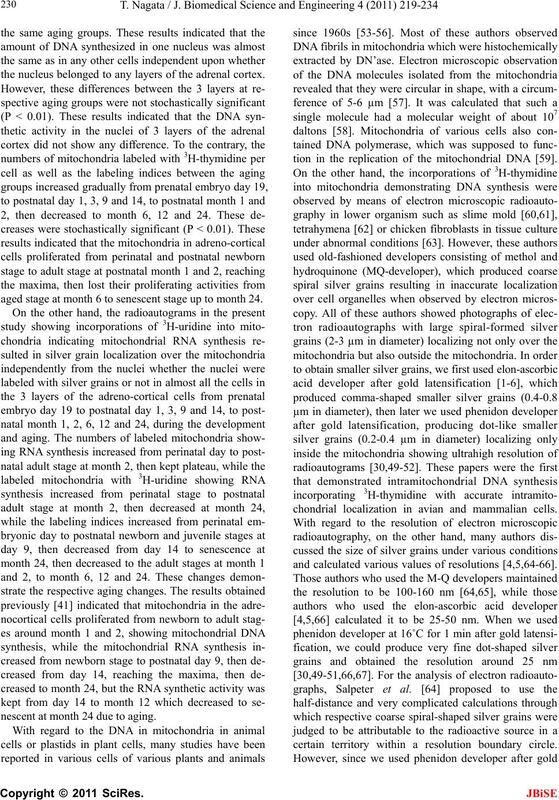 Histochemical Journal, 14, 197-204.
tional. Cong Electron Microscopy, Hamburg, 2, 305-306.
mice. 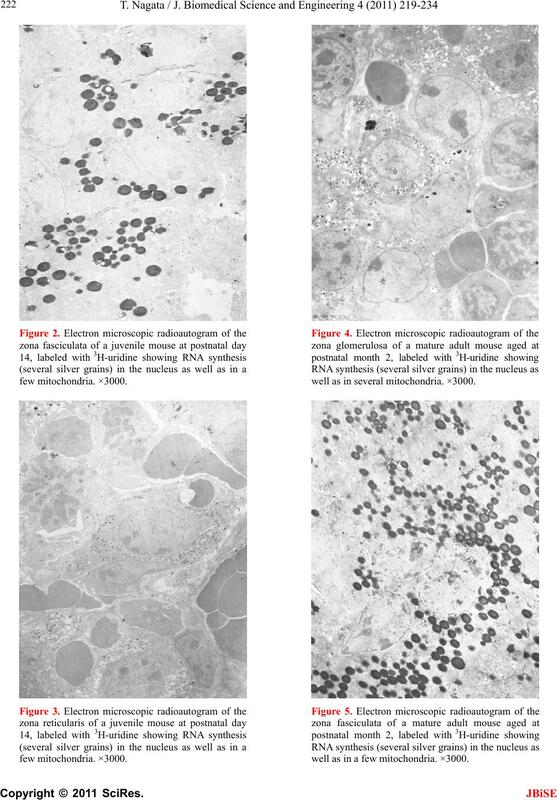 Medical Electron Microscopy, 27, 349-351.
developing mice. 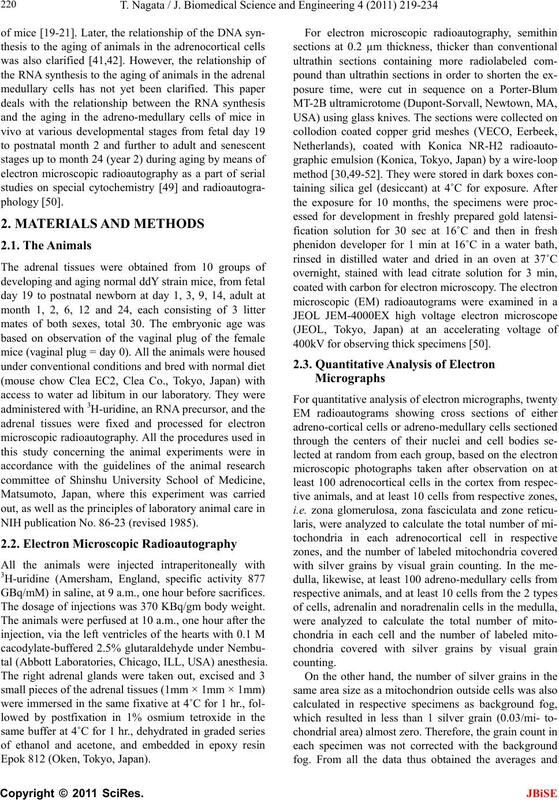 Annals of Microscopy, 6, 42-54.
microscopic radioautography. I. Nucleic acid synthesis. synthesis in the mitochondria of the liver of aging mouse. 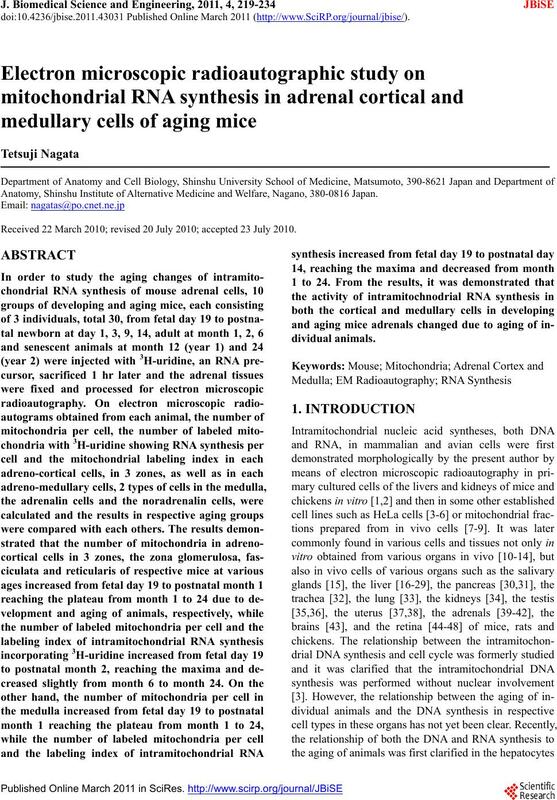 Annual Review of Biomedical Sciences, 9, 30-36.
tron Microscopy, Kyoto, 3, 2281- 2282.
cleic acid and protein synthesis in the aging mouse testis. Medical Electron Microscopy, 27, 360-362.
lecular synthesis of Leydig cells in aging mouse testis. Cell and Molecular Biology, 41, 145-150.
and Molecular Biology, 39, 221-233.
nucleic acid synthesis in the retina of chicken embryo II. Gunarso, W., Gao, F., Cui, H., Ma, H. and Nagata, T.
study on RNA synthesis in the retina of chick embryo. served by light and electron microscopic radioautography. Cell and Molecular Biology, 43, 189-201. 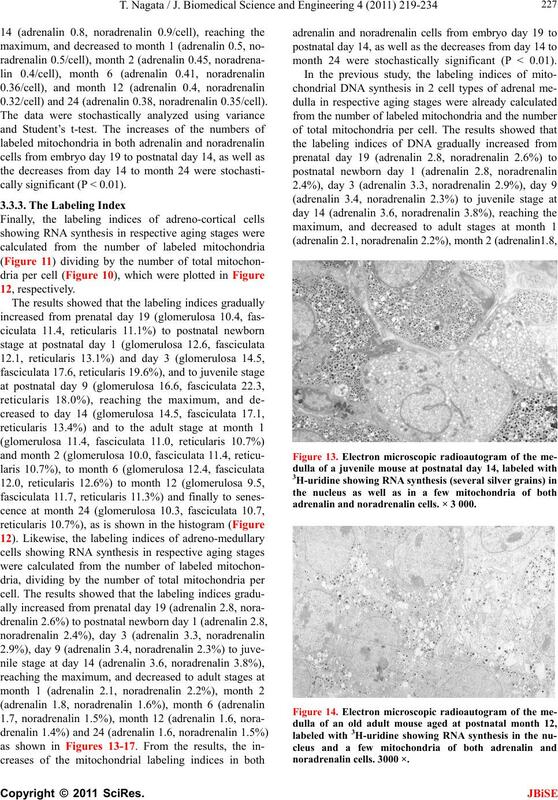 Nagata, T. (2001) Special cytochemistry in cell biology. Academic Press, New York, 211, 33-151.
and Cytochemistry, Urban & Fischer, Jena, 37, 57-226.
treatments. 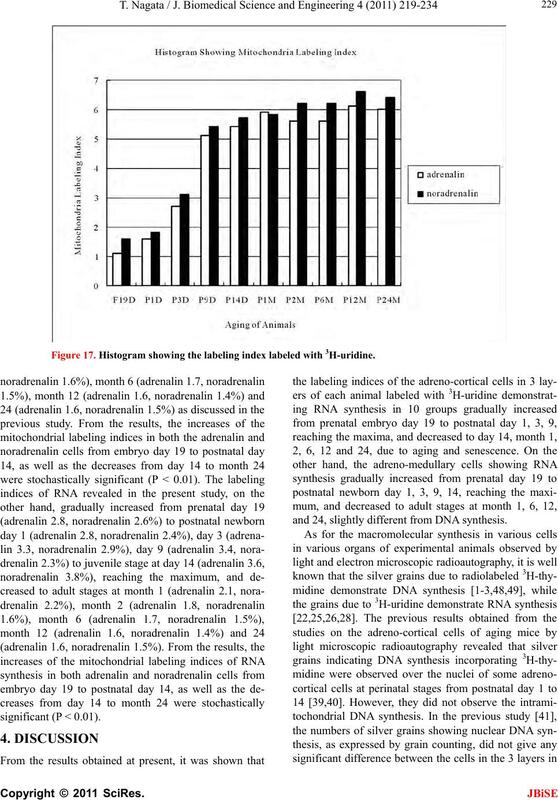 The Journal of Cell Biology, 19, 593-629.
dria: Inheritable system. Science, 145, 890-897.
drial DNA. Biochimica et Biophysica Acta, 119, 437-439. Van Nostrand-Reinhold, New York, 251-314.
mold. Experimental Cell Research, 39, 329-345.
mitosis. Cell Growth and Cell Division. In: Harris, R.J.C. ogy, Academic Press, New York, 2, 323-333. Histochemica et Cytochemica, 12, 443-450. Korr, H., Phillipi, V., Helg, C., Schiefer, J., Graeber, M.B. Korr, H., Kurz, C., Seidler, T.O., Sommer, D., Schmitz, C.
nal of Medical and Biological Research, 31, 289-298. Schmitz, C., Axmacher, B., Zunker, U. and Korr, H.